Customer service, like every country ever written about in a junior high school social studies paper, is a land of contrasts. Here are two brief examples I’ve encountered recently, one great, the other…the opposite of that. I opened the door just in time to see a FedEx truck pulling away, and found a door tag that opened with a hearty “Sorry we missed you!” I muttered something pithy under my breath, something like “…but you can’t be, because you didn’t…” and called their 800 number. After providing the door tag number and explaining that I could actually still see the delivery truck driving down the road, I asked if they could just ask the driver to turn around. I asked why Tuesday and not Monday, as, so far as I knew, Monday wasn’t a holiday. This was also hilarious, because, apparently, everybody but me knows that FedEx drivers only work Tuesday through Saturday. Clearly, I’m just not top-quality FedEx customer material. And I only disappointed them further when I told them that nobody would be home to sign for the package during normal business hours the following week, as my wife and I are both normal people who have jobs at normal businesses. At this point, they offered to hold it at a local facility, and gave me the choice of an office that’s here in Oshkosh (WI, if you’ve only just joined us) right on our way home from work, or the next closest in Appleton, which is about a 30 minute drive. I chose Oshkosh, they promised to call my wife’s cell phone when it was ready for pickup on Tuesday, and that was that. Except that of course it wasn’t. On Tuesday afternoon, we checked the package’s tracking, and it showed as “in transit” so we just went home. Wednesday was lot like Tuesday, except it’s harder to spell when we got home, there was a message on the answering machine we still have for some reason. The message was from FedEx, and announced happily that our package was now available, per our request, for pickup in Appleton. After a thoroughly perfunctory apology for the inconvenience, I was promised that the package would be relocated to Oshkosh by the end of the following day, Thursday. All I knew for certain at this point was that, wherever the package went and whenever it went there, it would not be in in Oshkosh on Thursday. As it turned out, it wasn’t there on Friday, either. One thing I’ve learned as my wisdom becomes more seasoned with age, is that some things just aren’t worth the effort, that it’s important to choose your battles; not every hill is worth dying on. On Saturday morning, my wife and I decided to go to Appleton to do some shopping. Since we were going to be there anyway, I decided to just let FedEx win this one. I actually said, aloud, “FedEx, you win. I surrender!” It was cathartic, even though it kind of scared the cat. We checked the tracking one last time, and drove to the FedEx office in Appleton. In my state of post-surrender Zen, I just let the whole thing go, wiping it from my memory with each exhalation, until it was all just gone. I actually began to believe that I’d asked for the package to be held in Appleton, that this was all just going according to plan. Ten minutes later, we left FedEx’s Appleton office empty-handed. I was actually laughing, though it was the kind of laugh that brought with it an involuntary twitch in my right eye. When we’d walked in and presented our door tag, the clerk’s face kind of contracted as if she was staring into the sun. After a breath or two, while mentally chanting “It’s not her fault, it’s not her fault”, I asked when it would get there. “Looks like it got there about a half hour ago,” she said. “So we can pick it up this afternoon, is that right?” I asked. “’Til Tuesday,” we finished in unison. This time, they were right, though that may just have been luck on their part. We picked it up in Oshkosh that following Tuesday. The package consisted of several bottles of wine, which, admittedly, helped. We opened the first one, and drank a toast to FedEx, declaring there to be no hard feelings. Which, of course, was a lie. 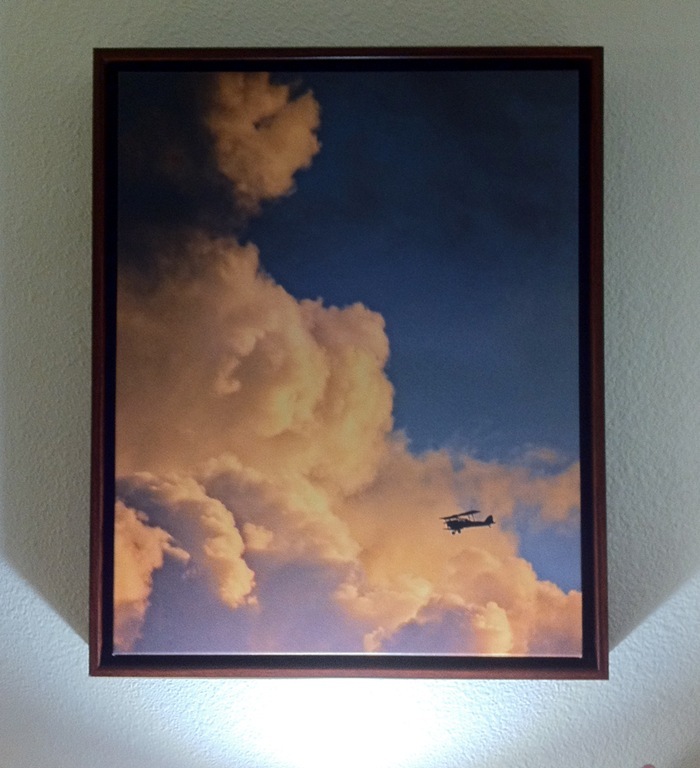 My wife bought a Groupon discount for a mounted print from CoD. The picture we chose is one that I think of as the best photograph of me ever taken: It’s got a beautiful sky, a gorgeous airplane, and all you can see of me is my head which is reduced to a single pixel. It was taken a few years ago in Guelph, ON, Canada, by my dear, dear friend Michelle. I placed the order for the print, and happily accepted a few of their upsold framing options. The print arrived a short time later. It was exceptionally well-packed, the workmanship on the mounting and the hardware was absolutely top-notch, and the picture itself was gorgeous, and totally exceeded my expectations. Except…it wasn’t framed in the way that I’d asked. I emailed CoD, and told them about the problem. I got an email back the next day that started with “NO worries!” and only got better. Just over a week later, I got a second picture, framed precisely as I’d asked. No charge, no RMA numbers, no mention of returning the “defective” picture whatsoever. “NO worries!” indeed. There was a problem, they fixed it right, and they fixed it fast. My guess is that they actually lost money on the deal, but it was still good business, because, in me, they have a happy and loyal customer for life. And, hopefully, some of you will remember my experience and consider my new pals at CoD for all of your made-to-order canvas printing needs, should you have any. And if you don’t have any, you should come up with some. Do the right thing. If nothing else, it’s just an awful lot easier. Gosh, I just really, really hate FedEx. Over years I have had nothing but trouble with them. I would say things like “Just leave the package at the door.” and then the driver would just decide against it. Along with late packages and other mishaps. I choose Brown when given a choice. excellent post! and why don’t fed ex people knock on the door!!!?? maybe it was the wrong day? and i completely agree about COD. They are AWESOME!!! I love CoD and totally agree with their amazing customer service and product! They deserve all of the kudos in the world for their great business!